Connect a TV, Two VCRs. o Composite video cables, stereo audio cables, RF coaxial cables. Why would you want this configuration? You can play from or record to both VCRs, record from one VCR to the other VCR, use either TV tuner in VCRs. What can you do with this configuration? o Watch TV with PIP. What settings do you need for this configuration? The TV will need to be set to Line 1 (L1) to receive the output from VCR 1. The second VCR needs to be set to channel 3 or 4 to get output from VCR 1. The first VCR needs to be set to Line 1 to get output from VCR 2. 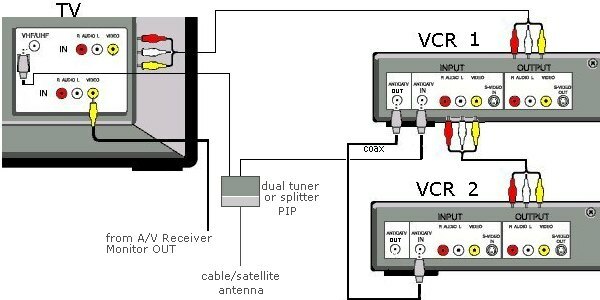 The TV signal comes in to the VCR and the TV if a splitter (analog cable TV) or dual cable/satellite tuner is used. This allows picture in a picture on the TV. Columbia ISA - Empowering consumers thru information.